In recent years, the role of plant secondary metabolites as protective constituents in the human diet has been a growing area of research. Unlike the traditional vitamins, they are not essential for short–term wellbeing, but there is increasing evidence that modest long–term intakes can have favourable impacts on the incidence of cancers and many chronic diseases, including cardiovascular disease and type II diabetes, which are occurring in Western populations with increasing frequency. This book covers the latest science on the metabolism and potential health benefits of teas, cocoa, coffee and their extracts in the human diet. From an opening chapter tracing the origins of teas, cocoa and coffee as beverage, the book proceeds to explore the phytochemical content of coffee, cocoa and the various types of tea. The bioavailability of secondary metabolites from each of the beverages is then considered in depth, and related directly to their health benefits. Embracing the full range of tea, coffee and cocoa beverages and products, the book offers the most up–to–date and comprehensive treatment of these increasingly important dietary components. 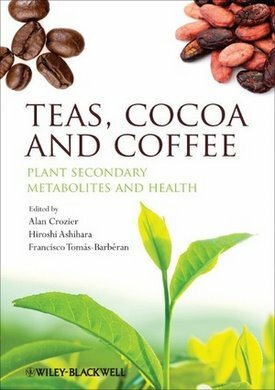 As the only book to bring together the latest information on the biochemistry and health benefits of teas, coffee and cocoa, this book is essential reading for food scientists and technologists involved in the production of tea, coffee and cocoa products. Nutritionists will value the book′s health focus, while agricultural scientists working on the cultivation of these crops will prize its scope and depth of detail. It is also an important resource for all those who use functional ingredients in other products, whether they are based in industry or research.